After years of hunting snow geese, Delta Waterfowl''s prostaff learned some fool-proof secrets to help fill your freezer with some tasty wild protein. Here they are. Spring snow goose hunters happily endure Mother Nature's unpredictable mood swings to chase geese that hold advanced degrees in survival. 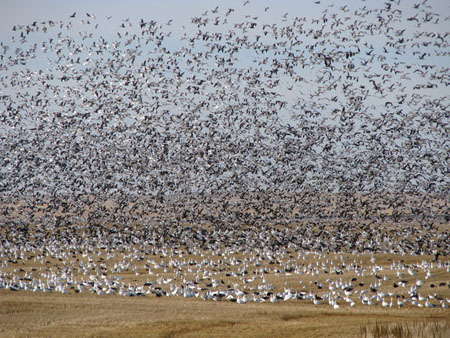 Snow geese have witnessed untold decoy spreads during their travels across the continent. They're savvy, cunning and difficult to hunt — even exasperating — but far from impossible. If you're looking for a prescription for successfully hunting spring snows, Delta Waterfowl has a small coterie of snow goose aficionados who are qualified to help. Here's what they have learned. 1) Scouting: "Watch the snow line; birds will be south of it, always," says Scott Terning, Delta's director of recruitment and education. "You can also use a number of online sources to aid your scouting and get refuge reports to determine bird concentrations, but remember nothing compares to doing real-time scouting." Terning recommends finding the largest concentration of birds on a lake, wetland or piece of sheet water. During the spring, he said, it's common to locate multiple roosts in a given area. "You want to scout these birds and locate where they are feeding for your hunt the next day," Terning says. "Taking these simple first steps will save you a lot of time and frustration." 2) The sheet water connection: "In the spring, finding sheet water is often the key element in finding birds," says Delta Waterfowl Senior Vice President John Devney. "They seem to decoy far better in fields with a little water in them. Spring snows will often look for corn stubble and sheet water in the same field." 3) Concealment: Fooling spring snows requires you stay well hidden. Take advantage of any field changes that allow for better concealment — from drainages to low spots to missed field vegetation. Conceal ground blinds from all angles and use decoys to break up their outlines. In grain fields it’s sometimes best to ditch the ground blinds and hunt in your best "whites." And don't forget your facemask. There's typically no margin for error. 4) Decoys: You don't need a 1,000-decoy spread to have a successful hunt, says Terning. "You need a respectable amount of decoys, and the best ones you have, because quality can be more important than quantity," he said, noting that you should team up with a friend if you don’t have enough decoys. "Bring along some floaters too. You'll want to use them in the sheet water." Keep decoys properly spaced, about 3 or 4 feet between each. The spread will look more natural from a distance and create the affect of having a larger spread. 5) Movement in decoys: It's very important to attract distant birds to your spread. Use kites, flyers, flags and other decoys to increase motion, especially directly behind your blinds on the upwind side of your spread. This will create the illusion of snows landing and leap-frogging over each other to feed. Bottom line: employ as much movement as possible, even to the point of putting a white vest on your dog. 8) Prepare for fog and mud: Spring hunters will likely find both in copious amounts. “Morning fog can really get guys mixed up when they’re looking for the field they received permission to hunt the night before, so make a mental note of landmarks to guide you to the right spot,” says Delta’s Terning. “If the fog has been really bad, use a GPS to plot the precise location of where you want to set up the following day.” Be prepared for mud, too; bring extra clothes/gear and have a plan for transporting decoys, because driving a truck and trailer into a field might not be an option. “Be respectful of landowner property and be extremely careful not to tear up muddy roads,” says Devney. 10) Food, glorious food: Have a plan. Bring a cooler, ice and cleaning materials. Know the rules on how to legally transport birds. Snow geese, contrary to popular myth, are superb table fare. Bring a grill or stove and prepare a feast in the field. An easy recipe: take the tenderloins from several goose breasts. Dredge them in seasoned flour and fry. Serve them with your favorite dipping sauce. Delta President Rob Olson says sweet chili or plum and hot mustard is a terrific combination. Find some great snow goose recipes at Delta Waterfowl.